Treat recycled water to drinking standards already! This editorial is good - it advocates for water to be re-used over and over again, which is key. However, at Surfrider, while we think it's great to use recycled water for agriculture, it would be even better if we went a step further and treated waste-water to drinking standards so we can drink it like they do in Orange County, CA and Scottsdale, AZ. The process of treating waste-water to drinking water for human consumption is growing in popularity and we need your help advocating for it. Not only would it go a long way to solving our water needs, but sending less polluted water out to the ocean would mean cleaner beaches. Watch our film to learn more. In October, the Santa Clara Valley Water District and the San Jose/Santa Clara Water Pollution Control Plant broke ground on a new water treatment facility that will produce up to 10 million gallons of highly purified water per day. The Advanced Water Treatment facility is designed to enhance the quality of recycled water used in San Jose, Santa Clara and Milpitas. The water produced in this facility will help us meet Silicon Valley's future water demands. The facility has been designed so that it can be expanded in the future to four times its size. As we face significant challenges with our imported water supplies and potential impacts from global climate change, this local water source could be a major part of our future water supply portfolio. The technology is impressive. Water that has undergone two levels of treatment at the adjacent wastewater treatment plant will undergo three additional advanced treatment stages: microfiltration, reverse osmosis and ultra-violet disinfection. This facility will be able to produce water that's as pure as or purer than most potable water sources. The water that is produced will then be blended with recycled water produced for the South Bay Water Recycling program, which has been providing recycled water to San Jose, Milpitas and Santa Clara customers for more than 10 years. The enhanced blend of water will help industrial users reduce operating costs, and it can be used on a wider variety of landscapes, due to a much lower level of salinity. As a result, it is expected that more customers will tap into the recycled water system. This will be the largest public facility of its kind in Northern California. The same technology is being used worldwide to produce highly purified water for drinking. Orange County is using the same technology to replenish groundwater. That project has been running successfully since 2008. The Santa Clara Valley Water District will own and operate the new treatment facility while the city of San Jose will continue to operate the South Bay Water Recycling program, which distributes recycled water to more than 600 industrial, agricultural and landscape users. In the works since 2006, the construction of the facility was kick-started by the success of California's congressional delegation to secure a share of federal stimulus funds. Congresswoman Zoe Lofgren, who spoke at the groundbreaking, was instrumental in securing $8.25 million from the American Recovery and Reinvestment Act of 2009 for the project. About 800 people will be put to work during the two years of construction. The water district is providing more than $32 million of the project's total cost. In addition to the federal stimulus funding, the California Department of Water Resources is providing $3 million from Proposition 50 funds. The San Jose/Santa Clara Water Pollution Control Plant, which is administered by the City of San Jose, is also a major partner, providing $11 million in support, and a lease for the facility lands. The cost of construction for the project is $42.4 million. This is a great example of an infrastructure project that is stimulating our local economy today while leaving a lasting legacy for the future. When the next drought inevitably rolls around, we'll all be glad to have this local water source available. As you know, the Earth is a watery place. But just how much water exists on, in, and above our planet? 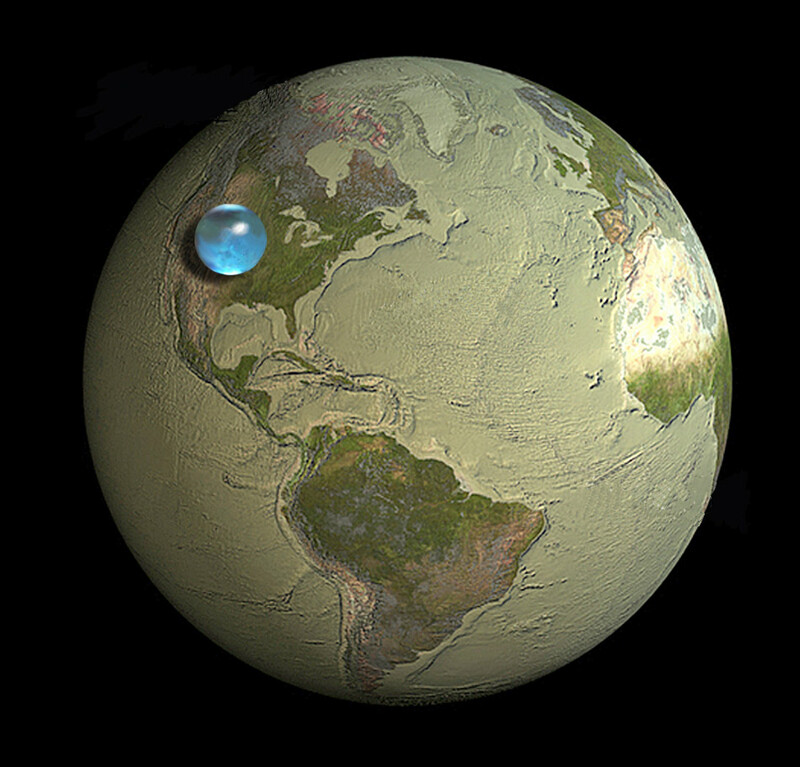 The picture above shows the size of a sphere that would contain all of Earth's water in comparison to the size of the Earth. You're probably thinking I missed a decimal point when running my calculator since surely all the water on, in, and above the Earth would fill a ball a lot larger than that "tiny" blue sphere sitting on the United States, reaching from about Salt Lake City, Utah to Topeka, Kansas. But, no, this diagram is indeed correct. About 70 percent of the Earth's surface is water-covered, and the oceans hold about 96.5 percent of all Earth's water. But water also exists in the air as water vapor, in rivers and lakes, in icecaps and glaciers, in the ground as soil moisture and aquifers, and even in you and your dog. Still, all that water would fit into that tiny ball.